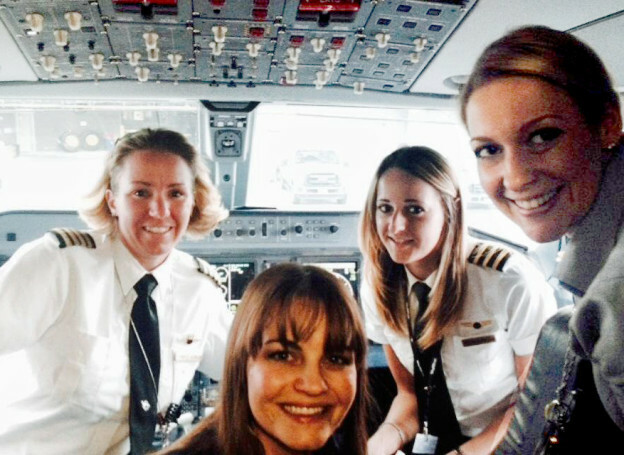 It’s becoming more and more common to see women flying commercial aircraft, thanks in part to those like Mary Conti, Suzy Garrett, Jen Johnson and many others at SkyWest. Not only have they realized their dream of flying, but they continue to set an example for other young women and girls to follow. Captain Jen Johnson with her crew on a recent flight. Hired in 1985, Mary is one of SkyWest’s first female captains. Mary, when did you decide to become a pilot and how did you end up flying for SkyWest? Mary: When I was 23, I became a pilot for my personal use, because no one hired female pilots (in 1976). I owned my own airplane, and when I finished my bachelor’s degree, I did some instructing. That led to a job selling airplanes, which led to a corporate job. I ended up flying tours out of Moab, Utah which then led me to flying for SkyWest. Obviously, there have been some changes in the industry since you began. What have you seen change? Mary: There are so many more females in aviation now! Only a few airlines were hiring female pilots when I started here. I was one of the first two female captains SkyWest had! There just weren’t many of us, but as more females started applying to be pilots, the entire industry has changed. Any advice for women who are considering an aviation career? Mary: I am so happy with my career choice. I would never trade it. I love flying. I love being out flying even on the more challenging days that test my skills. I think it’s the love of flying that brings pilots in, male or female. So my only advice is, if you have a real love for flying, do it! And there are real opportunities here at SkyWest. We have really good bases for people. As far as regionals go, SkyWest is the best. It’s a place where people want to stay. A lot of people, like me, come thinking that it’ll just be a starting place and they realize they love it! The company is strong. We’ve lasted all this time. I’ve seen so many other regionals go upside down or go away completely, but SkyWest is a good, stable company. We have a great reputation with our partners. I don’t think SkyWest will be going away any time soon. And above all, no one treats their people as good as SkyWest does. 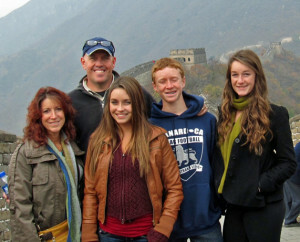 Captain Suzy Garrett with her family at the Great Wall of China. Suzy was the 11th female pilot hired at SkyWest. Hi Suzy! So, when did you KNOW you wanted to be a pilot? Suzy: In 8th grade. I was flying out of Phoenix and it was a beautiful day. There were puffy white clouds and blue skies, and I knew right then that I wanted to fly for a living. Why do you love being a pilot? Suzy: The variety of my days; I’m not just in an office. What makes SkyWest a good choice for a pilot? Suzy: Well, my husband is also a pilot and he flew for SkyWest too! We have three kids and I couldn’t have asked for a better fit for our family. I was really able to have my cake and eat it too. Here at SkyWest, I was able to be senior faster and hold a line that worked for my life and my family life. SkyWest made it really easy to tailor my schedule. Having so many domiciles also makes it great! Plus it’s a great company. It’s really fantastic! I never have worried about being furloughed or the company’s stability. I can count on SkyWest to be reliable. Those looking at choosing which regional to fly at should consider that portion! Don’t just look at the regionals as a quick stepping stone. You want a stable company no matter how long you plan to be there. Choose somewhere that is going to be a strong, stable company. What other advice would you give someone who is looking at becoming a pilot? Suzy: Number one would be, don’t take no for an answer and don’t give up. When I first started out to become a pilot, the military was the main path. I’m only 5’1” and the military and the major airlines had height requirements for their pilots. Everyone told me I should just quit, but I kept with it and soon the height requirements went away! Also, back then, there weren’t women pilots. There is a stereotype of who a pilot is and what they look like, but don’t believe it! Just go for it. You don’t have to be a John Wayne character to fly a plane! Don’t let anyone convince you otherwise! Joined SkyWest nearly 13 years ago. Jen, when did you decide you wanted to be a pilot? Jen: All I ever thought about was being a pilot. My dad and I flew in a 172 that belonged to one of his friends and I loved it. My dad got sick, but I knew it was for me. There still is nothing else I could see myself doing. What three words would you use to describe your time flying for SkyWest? Jen: I love it. I’ve been here 12 years. I’m a check airman on the E175, and I just love it here. I love where we fly. I love the people I work with. What do you enjoy most about being at SkyWest? Jen: The comradery here is great. It’s like a family. You know each other and remember each other, and there is a family feeling and people care about each other from the chief pilot down. Any advice for women considering a career as a pilot? Jen: You can do it! It’s a male-dominated field, but there’s no good reason you can’t do it. I suggest that you go fly! Once you get in the air one time, and the flying bug bites you (if it bites you like it did me) you’ll be hooked. Go out and try it! How have you seen the role of women in aviation change since you began? Jen: When I was a new hire here, 12 ½ years ago, I might have flown with another female pilot once during the year. I fly with a lot more female first officers now. There’s not a ton – it’s still an exciting thing when I get an all-female crew – but it feels like there are a lot more coming, and that’s a good thing. SkyWest Airlines is home to more than 11,000 of the best professionals in the airline industry. Those who are ready to pursue their dream of flying should apply online at www.skywest.com today! SkyWest is also proud to work with groups like Women in Aviation International to help advance the role of women in aviation and will be attending the 27th annual conference in Nashville, Tennessee March 10-12, 2016. Learn more at www.wai.org. And check out our blog highlighting one of our new CRJ First Officers who, after attending a Women in Aviation Conference, she knew that she wanted to fly for SkyWest.